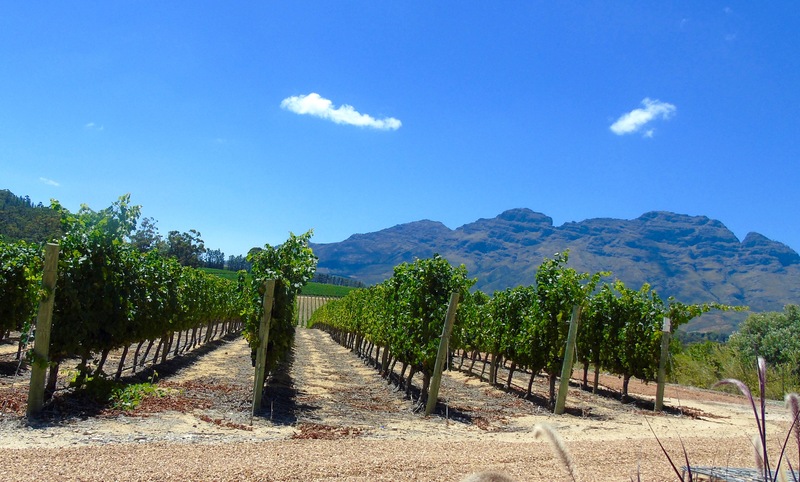 Today we’re heading back into the wonderful Winelands to the outskirts of Stellenbosch and Glenelly Wine Estate. In 2003, at the age of 78, May de Lencquesaing bought the estate which was part of the original Ida Valley Farm granted in 1682 by Simon van der Stel. Madame grew up in the heart of Bourdeaux’ vineyards in France and wanted to make South African wine with a French touch – an admirable goal for a 78-year-old. Especially since she had to start from scratch by replacing the existing fruit trees with vines. It’s good wine, too, as we sampled before we lunched. I particularly liked the unwooded Chardonnay and the Merlot. The 1783 stamp on the label represents the nearly 250 years of the family’s wine history. Downstairs, looking over perfectly manicured vines towards the mountains is The Vine Bistro. 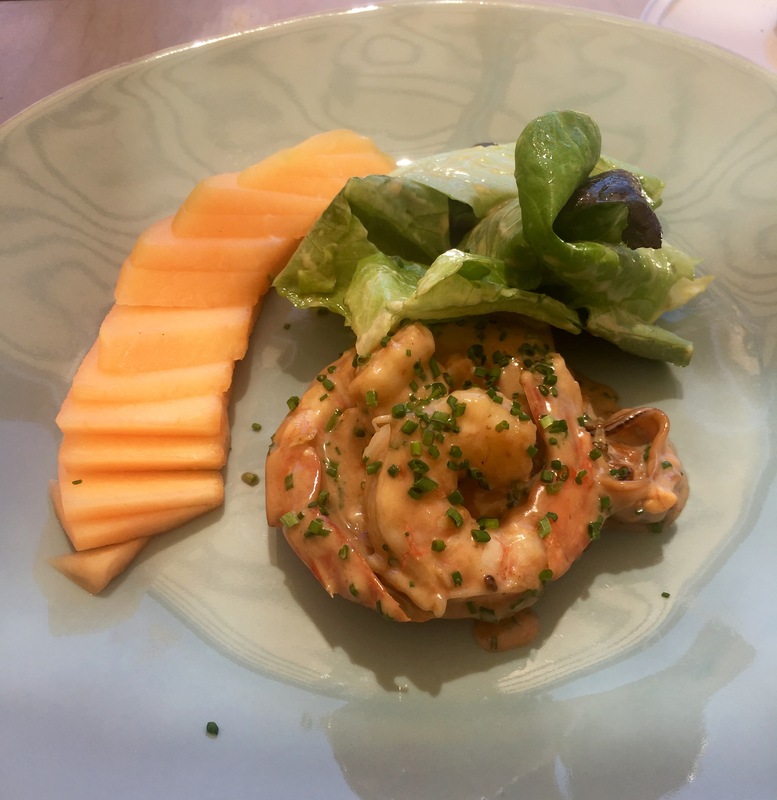 Chef Christophe Dehosse serves up french-inspired dishes using local ingredients. There are several offal dishes on the menu, all of which we sampled, being something of offal lovers. 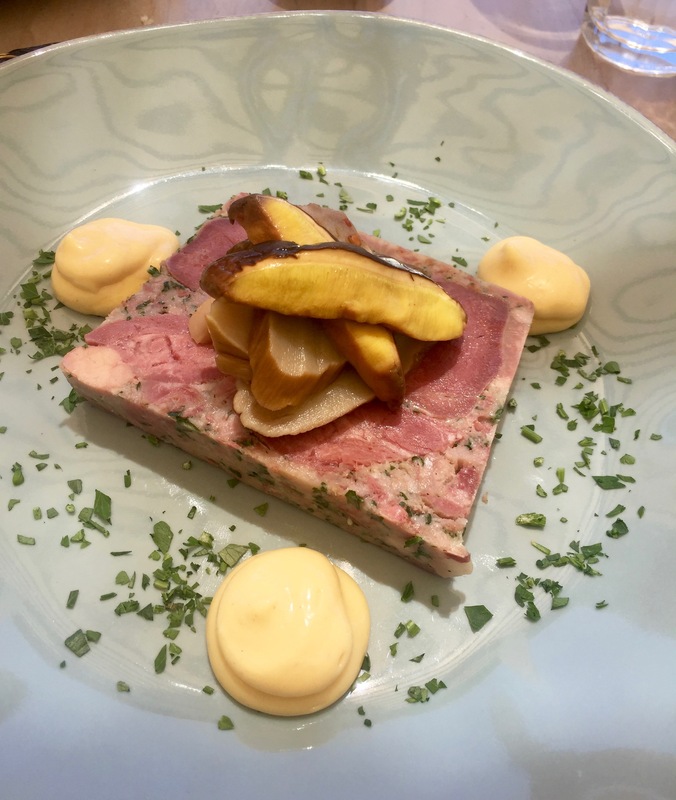 The pressed pork tongue terrine came with a zesty pickled porcini salad and dollops of aioli. Really love picked mushrooms. This colourful salad of spanspek (melon), mussels and prawns had a lovely light balsamic and chive dressing. The pork trotter was pan fried with a gribiche sauce, which is a mayonnaise-like French sauce. The dish was incredibly rich – a really indulgent starter. 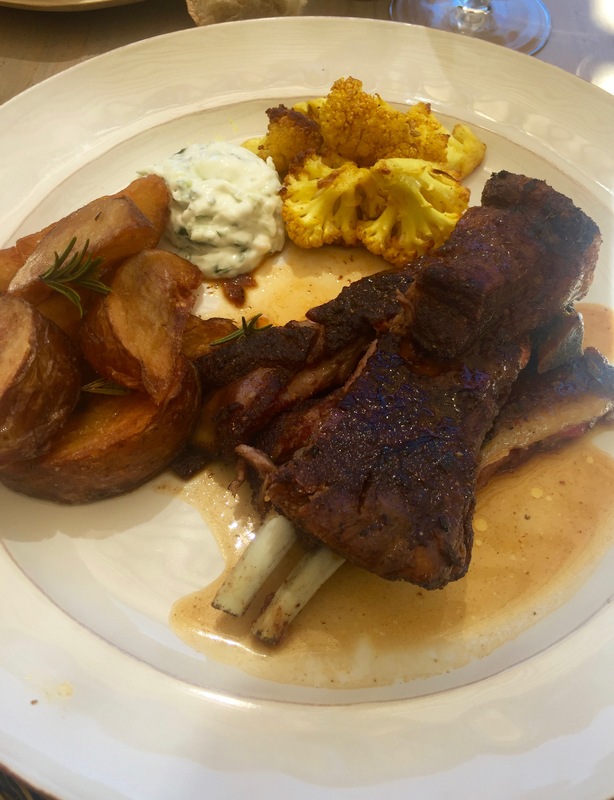 For mains I tucked into roast spicy lamb ribs with potato wedges and cauliflower fried with turmeric and fennel seed butter. Lovely crispy bits of lamb, perfectly cooked piping hot rosemary potatoes and spicy cauliflower made for a lovely combination. 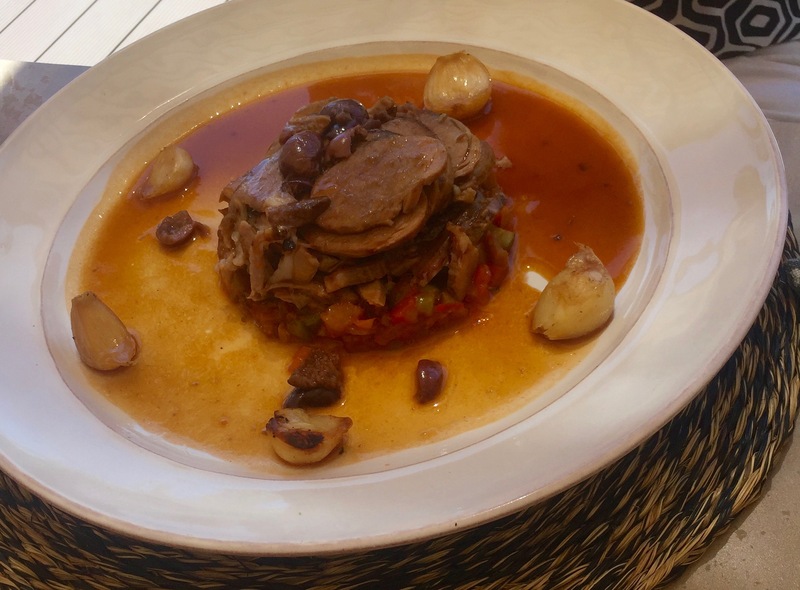 The slow roasted Karoo Lamb shoulder came with black olive, rosemary, ratatouille, confit garlic and gratin dauphinoise. And how’s this for the ultimate indulgent dish? 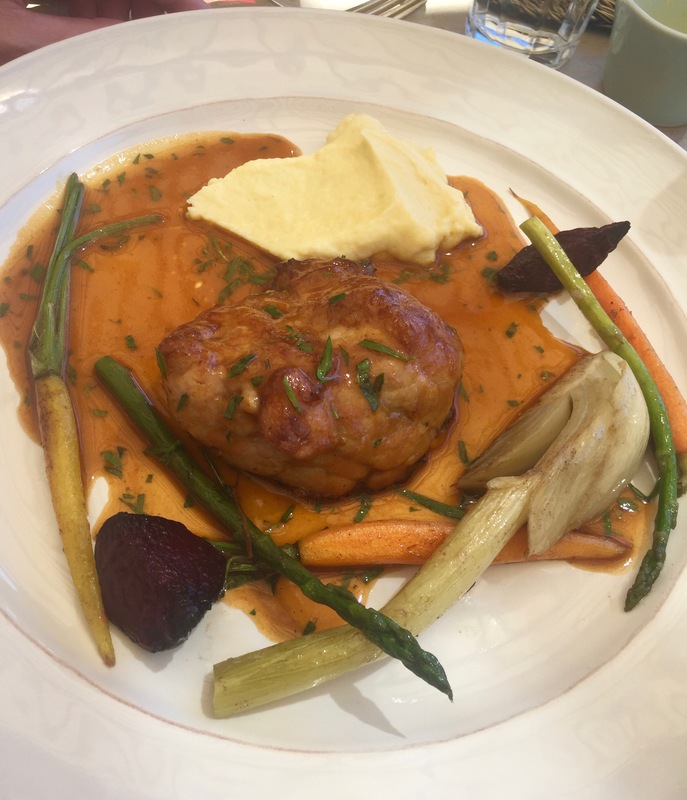 Roasted veal sweetbread with root vegetables, celeriac puree and fresh tarragon. That was quite a collection of classically French-influenced dishes. 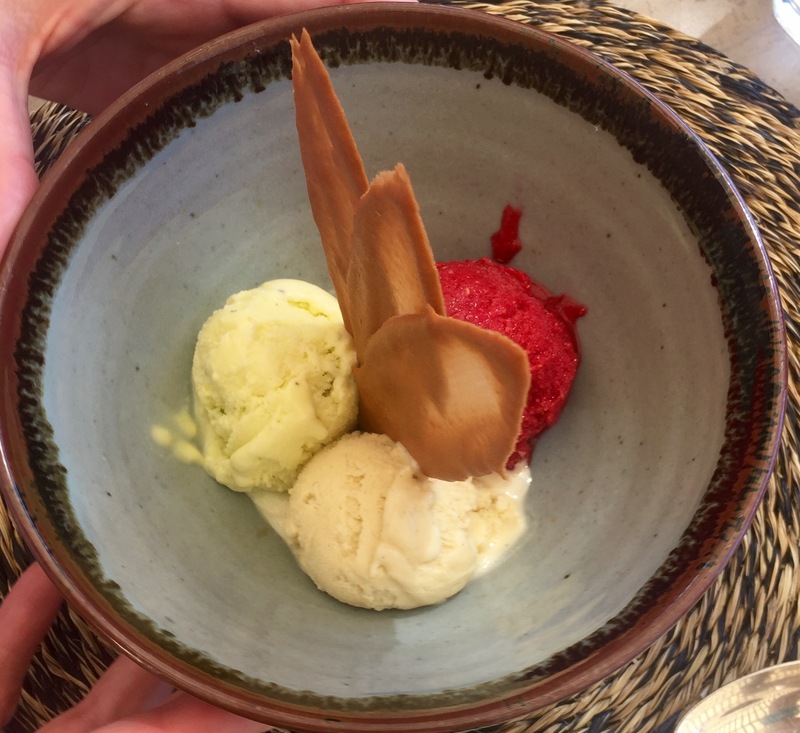 For dessert the trio of homemade ice-cream and sorbet made for the perfect refresher. 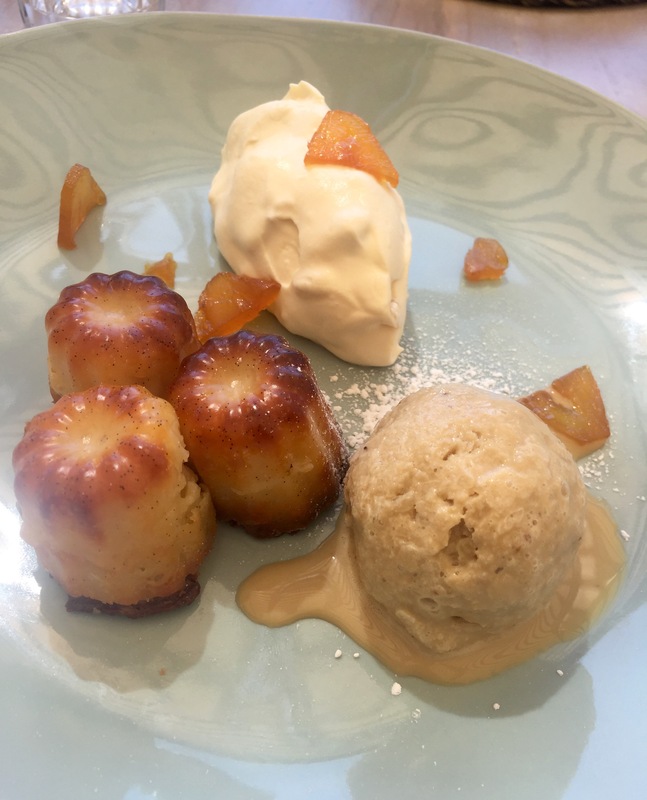 A classic French pud with a real South African twist next – Canele bordelais served with fynbos honey, rooibos tea ice cream and caramelised pineapple cream. A canele is a small French pastry flavoured with rum and vanilla, with a soft custard centre and a darker caramelised crust (in case you were wondering!). 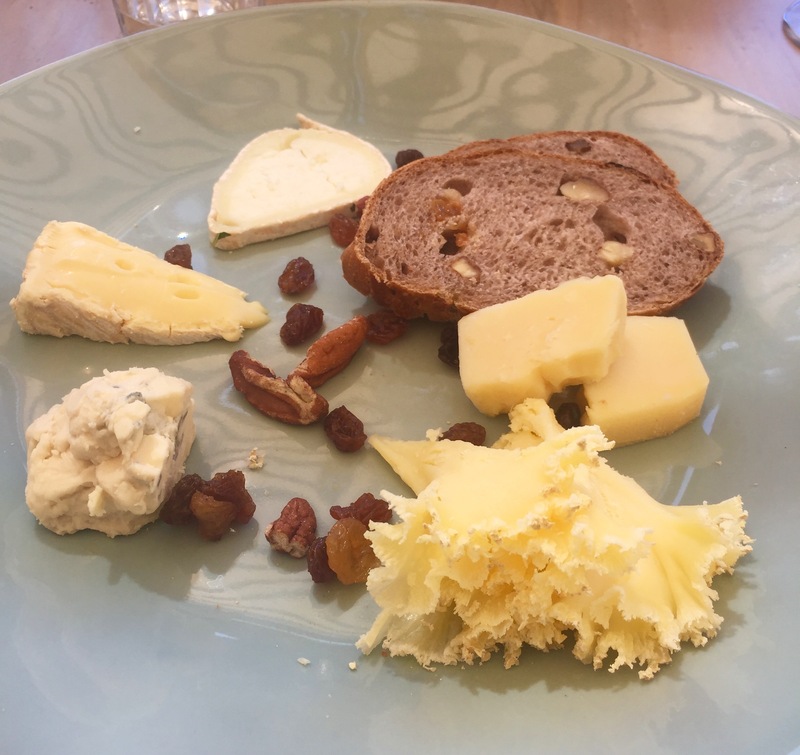 And finally, a delicious and varied selection of local South African cheeses, such a pretty plate. 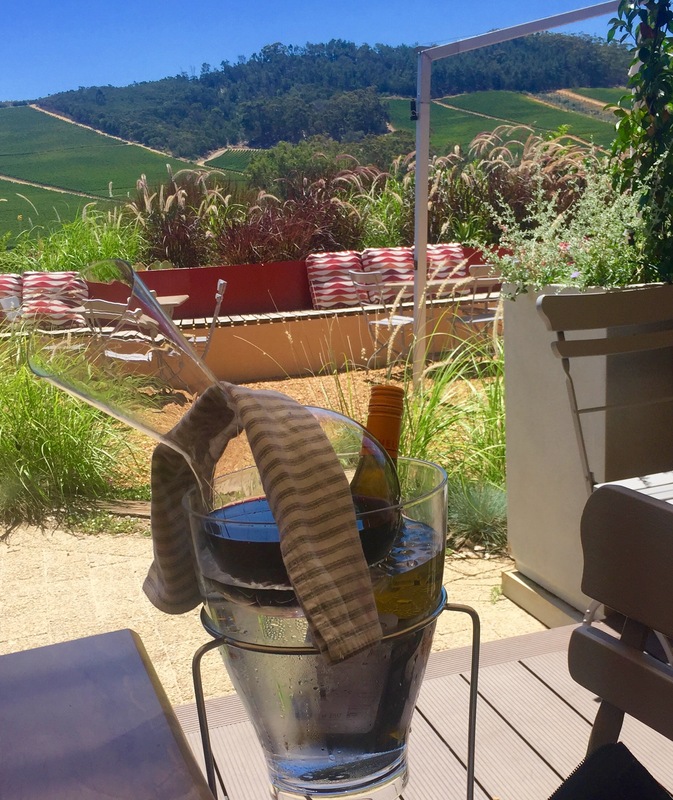 Service is friendly and the atmosphere is laid-back, making Glenelly a lovely place to spend a lazy Sunday afternoon. Oh and Madame is also still here – aged 91 – keeping up the wine-making family legacy with her grandsons. Most of our party ate off the set lunch menu which was R310 (£18 at today’s exchange rate) – incredibly good value. 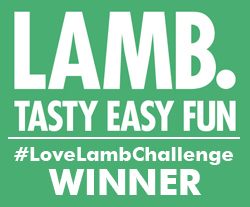 To give an indication of the a la carte, the sweetbreads were R210 (about £12.50) and the lamb shoulder R195 (about £11.50). Glenelly Wine Estate is at Lelie Street, Ida’s Valley, Stellenbosch. 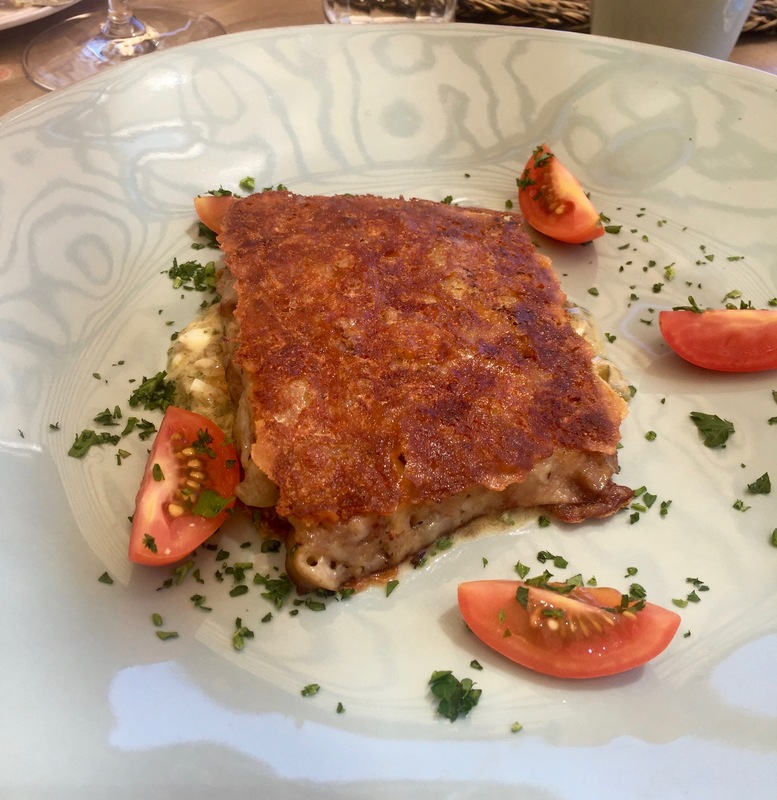 Do you have a favourite Stellenbosch restaurant that I should try? Do get in touch.